As a tractor clutch is used, wear takes place naturally on the friction surfaces. This will affect the setting of the clutch pedal free-play which must periodically be corrected. 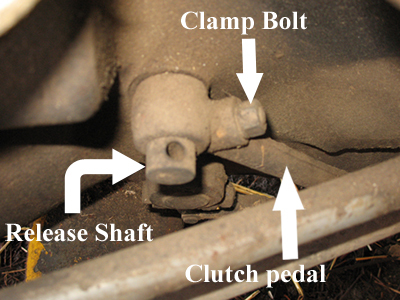 Adjustment is accomplished by slackening the clutch pedal clamp bolt and turning the clutch release shaft in relation to the pedal. Re-tighten the bolt and then check the soft free-play. Re-adjust if necessary. Once the clutch has been adjusted then the PTO clutch release studs can be checked/reset. Remove the access panel on the underside of the tractor clutch housing. 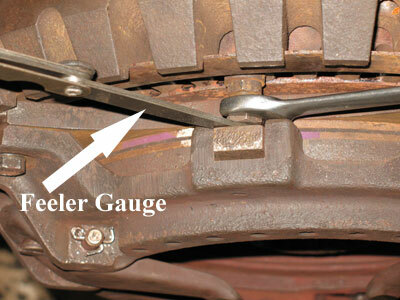 Using feeler guages measure the gap between the adjusting stud head and the PTO clutch release mechanism. This measurement should be between 0.089 – 0.091 inches. To adjust the setting, slacken the lock nut, move adjusting stud, re-tighten lock nut and re-measure the gap. The photograph below clearly shows this – this tractor has been split. There are three adjusting bolts spaced equally around the clutch to measure and adjust. The clutch can be turned using a lever through the access panel. Applying a dab of paint to each stud after adjustment is a good way to be sure that you have done each one. Hi, – great site, keep up the good work. The clutch is stiff on my MF65. Is there anything I can do about it?? This article may answer your question. I have MF 35 23C -59. Would you tell me, how i can adjust clutch? There are dual clutch. What is fingers distance from flywheel? 2.65? – 2.75? from face of the spacer ring segments. 4 13/32? – 4 15/32? from flywheel face. On an MF35 4 cyl gas motor, what is the correct torque for head bolts. Or studs with nuts I should say. Also the sequence? thank you very much for your help, I am very grateful. It seems strange that I, from the UK, have to ask you from the USA how to adjust an English tractor. I have a mf135 diesel.cant find the plate with serial number etc..anyway went to use it ,put in gear and heard a clunk,released clutched and nothing happens as if its in neutral…when in neutral an audible sort of clunk can be heard but once clutch is pushed in the sound goes.it does sound like its coming from the clutch plate area..also pto wont spin..any ideas people?? Do you have information on adjusting the clutch pto assembly for a Massey 90 tractor? Thanks. I own a MF35 and I think the clutch is gone. I tried to startit the other day and when I put it in gear the tractor started moving before the clutch was released. I adjusted the pedal and also adjusted the PTO clutch. I tried the clutch again but same problem. I have concluded a new clutch is needed, are there any tricks I should be aware of when splitting the tractor to replace the clutch? what type of engine has the massey ferguson 135. I have a MF 203 industrial that has leaked trans fluid and wet the clutch. Does anyone know which clutch this the 203 has? Is the adjustment procedure yhe same ads the 35? There is a small hole on the underside of the clutch housing in which there should be a split pin fitted loosely in. The idea is that the split pin just vibrates about with the movement of the tractor and prevents the hole from bunging with dirt. Any small amount of oil should then just drain out of this hole. If the hole gets blocked then the oil level can fill up in the bell housing. Basically this will ruin the friction capabilities of the clutch plates and you would need to replace the clutch and fix the oil leak at the same time. If the leak is bad then oil can get flicked onto the clutch plates even if the drain hole is clear. what would happen if oil from the engine got into the clutch bell housing? Hi, Can you tell me how to adjust the clutch for the MF 65? When engaging the clutch while motor is running, I cannot engage the PTO. Only when motor is off .. I think this tractor has a live PTO (whatever that means..) It also has a “ground PTO” setting, am not sure what that does either ..
How do you adjust the pto clutch on a MF 253? On the mf30 it has two sets of adjustment bolt. One set on the inside (3) and one set on the outside (3) which set will adjust the clutch for travel and which one adjust the clutch for the PTO?